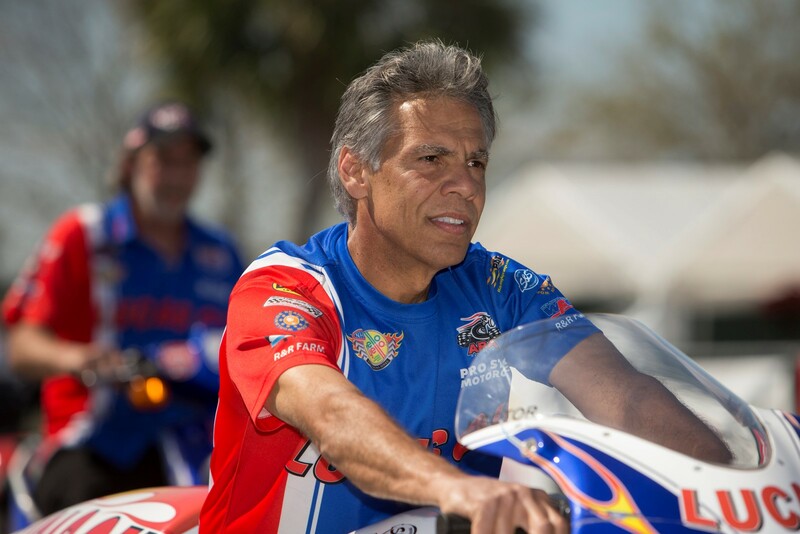 Back when Hector Arana won the NHRA event in Dallas en route to his first and only NHRA Pro Stock Motorcycle Championship in 2009, no one would have guessed that it would take over five years before he won his next national event. 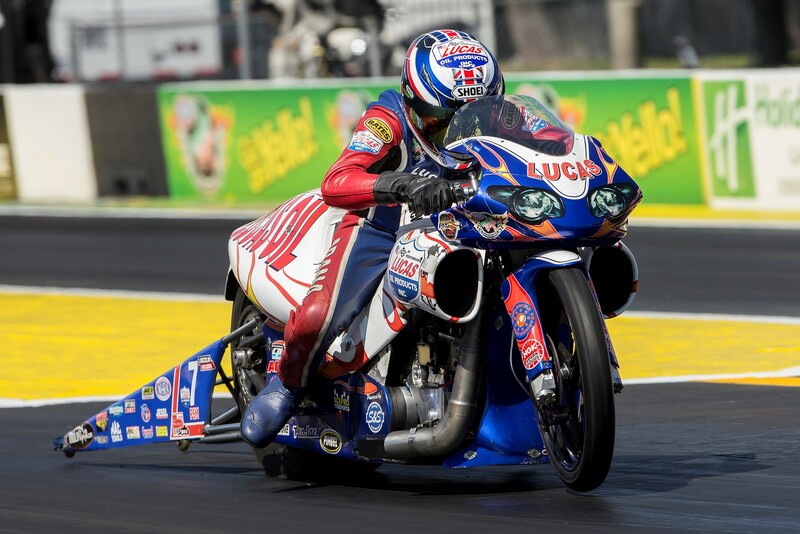 After making the final round 11 times since his last win, Arana strode into the winners circle after riding his Lucas Oil S&S-powered Buell to a final round victory over the Harley-Davidson of Eddie Krawiec at the Summit Racing Southern Nationals at Atlanta Dragway. After opening the season on a new EBR-bodied racebike, Arana quickly switched back to his trusty Buell when handling problems became apparent on the new machine. In Atlanta he was solidly in the top half of the field throughout qualifying and ended up in the seventh spot at 6.909 seconds, 195.62 mph. Leading the Southern Nationals field was Gainesville winner Karen Stoffer with a 6.875 at 195.59 mph on her Suzuki followed by the Suzuki of Jimmy Underdahl at 6.880/195.85. It was the first time Suzuki’s qualified 1-2 since the 2011 edition of the Southern Nationals. Following the Suzuki’s were a pair of S&S-powered Buells with Hector Arana, Jr. taking the third spot at 6.89/196 on his Lucas Oil Buell and Angelle Sampey on her JoinTeamAngelle.com Buell qualifying fourth at 6.89/194. Arana had a hard road during eliminations, first taking out defending series champion Andrew Hines on his H-D V-Rod and then number two qualifier, Underdahl, with a pair of identical 6.915s. In the semifinals Arana met his son, Hector Jr. who schooled him on the tree, jumping out to a big holeshot, but struggled downtrack. The elder Arana took the win with a 6.93 to make is 21st final round. The final looked like it would be over quickly has Krawiec got the holeshot as Arana launched toward the center line. Arana made a hard correction as Krawiec suffered mechanical problems and shut off. Arana kept the bike in the lane and took the win light with an off-pace run of 7.32 seconds. The win was his seventh career victory. With the win, Arana moved up to third place in the Mello Yello championship points. Their rivalry with the Harley team is in full swing with Krawiec and Hines being 1 and 2 and father and son Arana at 3 and 4. With the taste of victory, Arana is driven even harder to find that elusive horsepower. The next event on the NHRA Mello Yello Pro Stock Motorcycle championship tour is the Toyota Summernationals at Englishtown, NJ, June 4-7.